Beach holiday is about relaxing and getting away from it all. Here are probably the 5 best beaches to visit while in the Albanian Riviera. This article should not be treated as an official ranking, as each person has their own unique personal preference. The verdict as to which beach is the best is a judgment which can be made only by visiting in person. So, relax and go to the beach! If you have visited any of these Albania beaches before, and would like to share your experience, please leave your comment in the comments section. These ambient video clips below have been made by Fatmir Mehmeti (for best viewing experience turn up your sound volume). 7km long, sandwiched between high pine-covered mountains and rolling olive groves that sit above the coastline, this gorgeous pebble beach boasts crystal-clear water which is ideal for swimming, snorkeling and diving. In high summer season sea temperature here is about 26 degrees which makes all kind of water activities a delightful experience. Dhermi beach consists of many small secluded parts. Heading north from the main beach area where most of the restaurants and hotels are located, a slightly overgrown path leads to more isolated bays and rocky coves of Drymades. There are a few family run hotels and bungalows here and there but you’ll hardly see anybody, so finding your own “private beach” is even easier than in Dhermi. Jale, until recently a small coastal village, without much exaggeration boasts a truly amazing beach. The main beach area remains quiet, with few music bars and restaurants which are relatively noiseless comparing to mega-disco built around the coast in Velipoja or Ksamili. The sea here is most certainly one of the cleanest along the whole of Ionian coast. One of the best known beaches in the Albanian Riviera is Ksamili beach. Located some 15 km south of Sarande, near the world famous archaeological site of Butrint, this beautiful beach with white sandy shores and blue waters which give it a more Caribbean look is one of the most visited coastal resorts in Albania, from both local and foreign tourists. Ksamili beach is ideal for relaxing and is often filled out with beach chairs where sun worshippers can sunbathe. There are a number of restaurants and bars in the area that offer drinks and good food at affordable prices. Ksamili beach is closer to the Greek island of Corfu than any other on this part of Albanian coastline. The primary attractions here are small islets, where a number of isolated coves as well as restaurants serving fresh seafood are located, that can be easily reached by a small boat. There are a number of small hotels and guesthouses in the village, some are open all year round. Be sure to book yours well in advance during high season. Pasqyrat beach is undoubtly one of the most beautiful in the whole Albanian Riviera. The beach is located near Ksamili, about 7km south from Sarande. This gorgeous beach is secluded and ideal for a relaxed stay. The beach holds such a name (pasqyrat = statements) because of the surrounding rocks which appear to reflect the stunning beauty of nature. 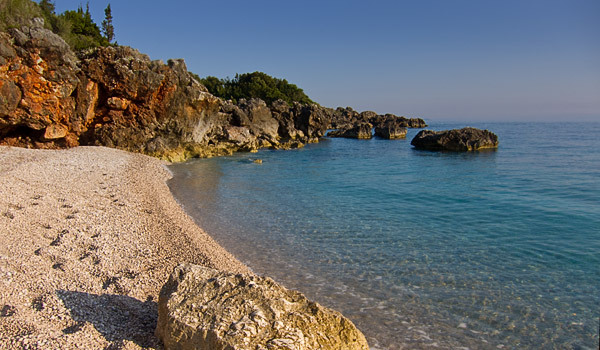 This stony beach is maintained and lets you enjoy some of the most magnificent views in the whole Ionian coast. The beach is reachable by a car and a small restaurant that serves seafood fruit and fresh fish can be found nearby. Manastir beach located halfway between Sarande and Ksamili lies in a small bay near hotel Kristal. The sea water here is crystal clear and there is plenty of sunshine to enjoy until the day’s end. The parking is free and you can eat the seafood at the restaurant of hotel Kristal. Albanian Riviera is really GREAT! Better than even the beaches in the Greece! Very healthy and clean sand, and do not forget the super healthy organic food! I have been there for 27 years and I know what I am writing to all of you! Even Zeus loved to be there and also Alexander The Great grew up there in the south and east Albania! And more and more big names that have been there and wanted a piece of the real SWEET PARADISE OF THE VIRGING PLACES and from one the oldest nations in the Ballkans and from the south Europe!